SmartFTP is an FTP (File Transfer Protocol), FTPS, SFTP, WebDAV, S3, SSH, Terminal client. It allows you to transfer files between your local computer and a server on the Internet. With its many basic and advanced features, SmartFTP also offers secure, reliable and efficient transfers that make it a powerful tool. The UI should be in wikipedia as an example of feature creep. Several freeware FTP clients are better than this bloated mess. Yep - garbageware. I really like this client. Too bad it isn't free anymore. It used to be. Also nice that it's availabe in an x64 version. [edit to original comment] I was a little critical of SmartFTP recently. 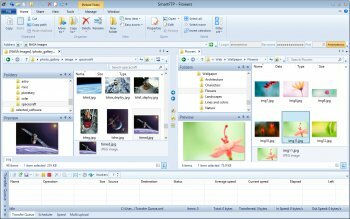 However, after trying numerous other FTP clients, I must say that despite the occasional bug in SmartFTP, it remains on of the most easy to use FTP applications out there. It is lacking in some areas, but its UI is nicely integrated with explorer and very convenient. I find that I work faster with SmartFTP than with other FTP clients. I hope to see more active development on it in the future, including a big QA check to ensure that all known errata is fixed. Then it will be perfect and well worth the cost. All new versions are not free anymore. It's simply a demo version of the shareware version. I mean, FileZilla can do the same things, got the same ugly GUI, but unlike SmartFTP FZ is free. So why pay for something that you can have for free? This posting is way out of date, since version 3.0 is out now. That's what I just ran a trial of--very briefly. A room full of drunk, retarded monkeys couldn't come up with a buggier mess than SmartFTP. It took me about 3 minutes to find annoying, reproducible bugs. The only people who seem to do QA are freeware developers. Unfortunately, they're also the ones who are least interested and/or able to add features and documentation to their programs--perhaps because they're busy doing QA (which, I fully acknowledge, must come first). As a nice little bonus, SmartFTP leaves a slew of CLSID keys and other crap in the registry and on the file system after it has been [COUGH] "uninstalled". There's no excuse for commercial software to be this pathetic. I work for a software vendor--no I won't say who--but they'd NEVER release crap like this. Didn't SmartFTP use to be completely free? and does it still nag you constantly that the build your running was compiled along time ago based off your calender date and that there is probably an update, making a very annoying nag system for closed networks... Try FileZilla people. Been using SmartFTP for a long time. Its free, the interface looks pretty. Its so easy to use. I would never use anything else. I'm not sure I see anything that FTPRush has that SmartFTP doesn't, other than a surprising $29.95 price tag (who pays for FTP software anymore?). SmartFTP has everything you need and is rock solid. The GUI can be a little overwhelming in some spots when you first see it, but you don't have to use all of it if you don't want to (especially some of the queue features). What Diam0nd said. SmartFTP has long been a hog, its UI cluttered, and few "modern" options. If this were 2002, this would be a fine FTP app. But today, it's a testament to sheer bulk. Best FTP Client available. Very easy layout, easy to use. Very very advanced if ya know what your doing. If I could I would rate it a 10!